President Donald Trump on Wednesday portrayed the midterm election results as "an incredible day" for his Republicans despite a Democratic takeover of the U.S. House of Representatives that will lead to greater restraints on his administration. 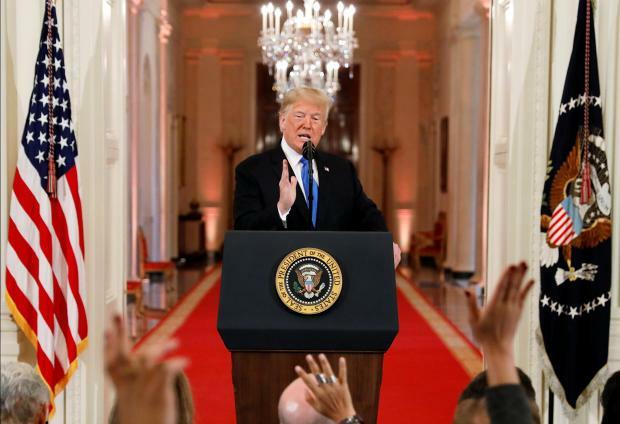 At a White House news conference, Trump argued that Republicans beat historical odds in Tuesday's elections, saying the party's gains in the U.S. Senate outweighed its loss of the House. He also mocked those Republican candidates who lost their seats after refusing to embrace him on the campaign trail, such as U.S. Representative Barbara Comstock of Virginia. "It was a big day yesterday, an incredible day," he said in what was only his third formal solo news conference at the White House. "Last night the R party defied history to expand our Senate majority while significantly beating expectations in the House." Republicans expanded their control of the U.S. Senate, knocking off at least three Democratic incumbents on Tuesday, following a divisive campaign marked by fierce clashes over race and immigration. But they lost their majority in the House, a setback for the president after a campaign that became a referendum on his combative leadership. There may be some room, however, for Trump and Democrats to work together on issues with bipartisan support such as a package to improve infrastructure or protections against prescription drug price increases. He said Nancy Pelosi, who may be the next speaker of the House, had expressed to him in a phone call a desire to work together. But Trump doubted there would be much common ground if Democrats press investigations. "You can't do it simultaneously," he said.